These are things we designed and built to showcase our capabilities as well as stir up creative thinking with our clients. When designing our own lobby sign we tried to incorporate every aspect of our work. 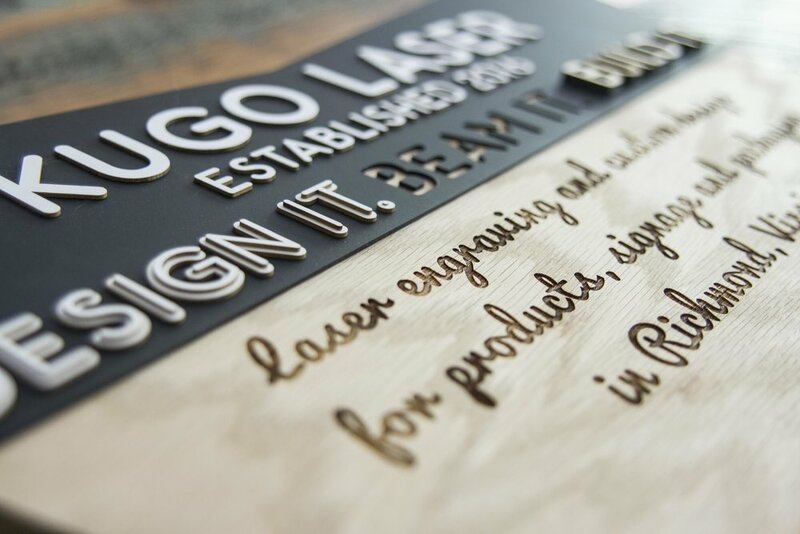 Our sign was CNC routed and fitted with a laser cut face plate. Then we applied laser cut lettering out of card stock and oak plywood. Lastly, we laser engraved the bottom portion of the sign and fitted a bracket for installation. Our live edge map clocks are cut from a slabs of maple we purchased locally. 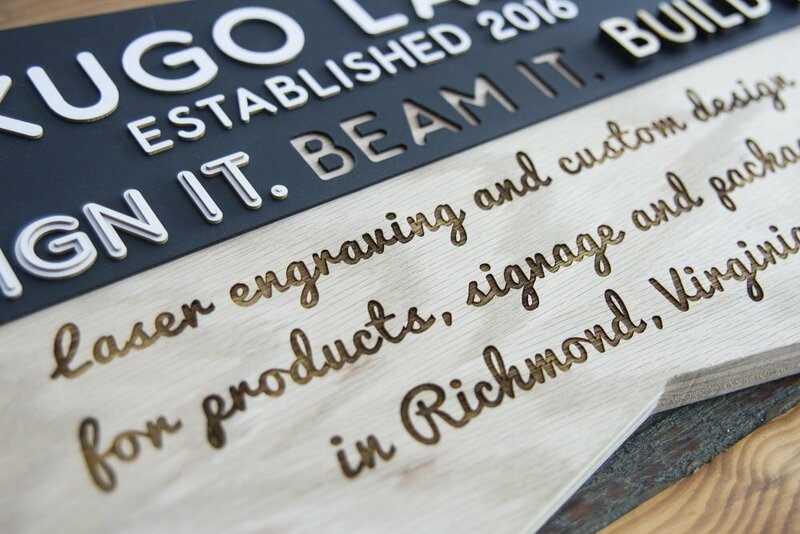 The wood is then engraved, drilled, coated, and fitted with a clock motor. We have a large library of city maps allowing customers to place custom orders. We wanted to make something that showcased how different materials can compliment each other. Inspired by NASA's golden mirrors, we designed the Honeycomb Clock around the James Webb Space Telescope. 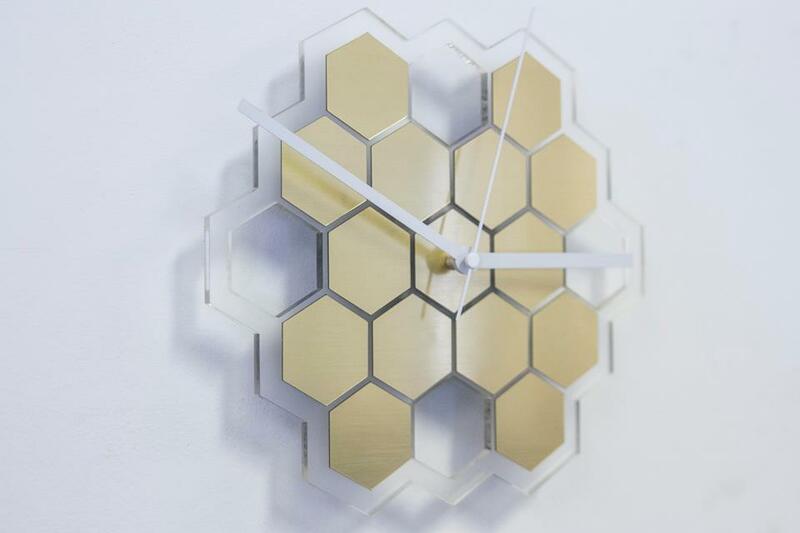 Each clock is fitted with 15 brushed gold hexagons and backed with frosted acrylic. Taking the same artwork from our map clocks we created the Map Wallet. Each wallet is fitted with a cash pocket and two smaller pockets for holding credit and debit cards. When we re-designed our business cards we took a lot of different factors into account. We asked ourselves what happens to most business cards? Our thought process is they go into your wallet, which then goes into your pocket, which then inevitably goes into the washing machine. While we do appreciate you washing your pants, we didn't want our cards to go with them. We started designing a card that's a handheld sample of what we create in our day-to-day projects as well as something you wouldn't throw away. To capture this, each card is laser cut both front and back with a solid white core. This gives them a three dimensional shape that you can touch and feel. Also, the "KUGO KARD" is cut from three ply stock, making them roughly an eighth of an inch thick. That's 10 times thicker than an average business card. It's our little way of being a pain in your bum...but only if you put it in your wallet.